There are a whole category of devices, called bio-reactors that exist to capitalize on the byproducts or workings of micro bacteria like beer, citric acid, ethanol, penicillin.. 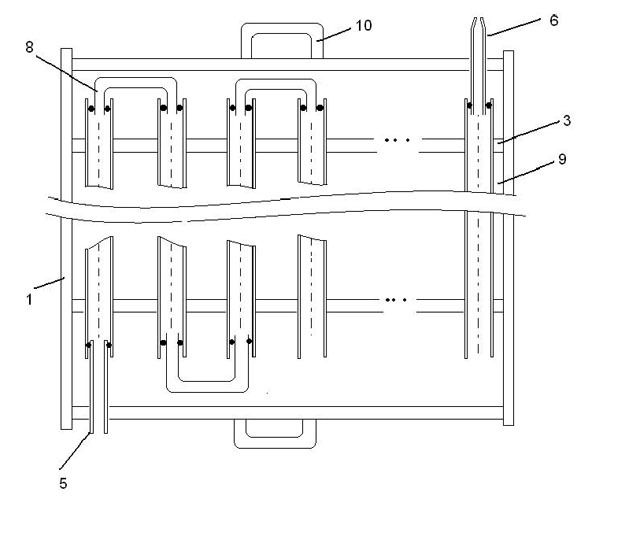 There are three different types of bio-reactors, these are Batch, Fed Batch and continuing process reactors. The major difference between the batch, and continuing process reactors is that batch reactors are filled and then emptied. The time in between being determined by the length of the systematization process of the bacteria or growth time of the bacteria, if a specific amount is needed. Then the reactor will be completely emptied and replaced with new substrate and organisms. 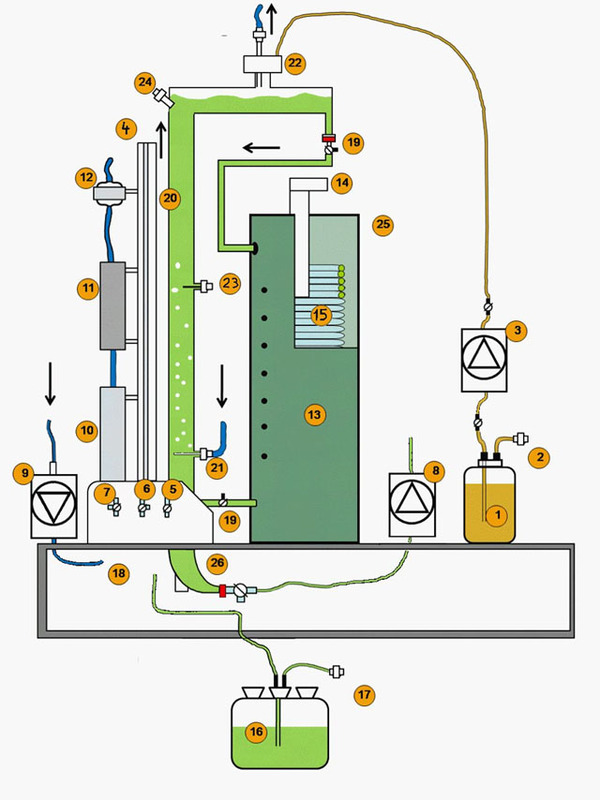 In a continuous reactor the substrate is continually added, and biomass continually removed, without every entirely filling or emptying the reactor. Bio-reactors must be absolutely sterile to function properly, this means no foreign organisms, blemishes in the reactor itself. In a batch reactor this isn't so difficult to maintain. Every time the medium is removed, the reactor is checked for defects, cleaned, and sterilized. In a continues, which theoretically, could run for ever, it is of vital importance to maintain sterile conditions. Our goal was to design and build a reactor that would produce organic fertilizer using blue green algae. After a prototype, our final goal was to produce a full size and marketable version of the tube reactor. In our reactor we used a strain of bacteria that the HBLA Ursprung had determined could fix as much nitrogen as possible. This we hoped would result in a cheaper, organic, and non polluting form of nitrogen production. Since, current nitrogen production involves the heavy use of petroleum products, as well as poses a threat as ammonia to ground water. 3. What Resources does one need? For a mineral "feed" for our Cyanobacteria (Blue Algaue) we created an ionic solution from ingredients that the Institute for Limnology (Gmunden) told us were good nutrients for bacteria. We mixed them together and in a screwtop flask and placed in a steam sterilizer (Certoclav) at 124 degrees °C for forty minutes for total sterilization. The necessary nitrogen producing materials were pumped through a large water pump, through a self designed pre-filter, through a water flow measuring device, and into the sterilization filter, from where the gas from gas container (pore widthG1) is finely mixed into the substrate. Here we could control the individual make up of the air we were adding into the liquid medium. 78 % Nitrogen, 21% Oxygen, 1% inert gases and 0,03% Carbon dioxide. Our bacteria needed the Carbon dioxide for growth, but this was no problem because of CO2s ability to be dissolved into water very easily. Also dissolved was Nitrogen which was of course essential for our work, same as the Oxygen. What ratio of these gasses is best was not researched due to time constraints, and will be addressed in the next phase of the project. Through a complex photo induced process Nitrogenease, an enzyme present in Cyanobacteria, can take dissolved Nitrogen from the substrate and through a Redox -Reaction create an organic material. Glutamin plays an important role in the processes of creating proteins for the cell and its neighbors. For our Photobacteria, electro magnetic energy is very important, this means that we needed a continues light source for our lab reactor that would run day and night. We needed to simulate a quasi sun to give us the best test results. For our reactor we used the same light system, that our colleagues in Urspring had experimented with, that is the Fa. Osram with a color number of "965" (close to the spectrum of sunlight). We worked on the with the reactor with a radiant power of 20 W/M squared. (which was placed about 25-30mm from the surface of the reactor.) After our first run, we decided that the best practical use would be to use the sun in summer, with its natural wavelengths and heat. In the winter, we thought that the type of lamp light that we used in the simulation surrounded with mirrors or other reflective units that would amplify the heat from the light into the reactor. Our continual Nitrogen sandwich collector, should be insulated for the winter in order to conserve as much energy as possible for the production of nitrogen. Ideally the needed electric energy would be provided through solar panels. With a vertical setup reactor we were able to take advantage of the Kamin effect, the movement of heat up, to use the heat from the light source and air intake to maintain an optimal temperature of between 20-30 degrees C. With a large reactor, in a green house, or positioned on the roof, the sun can heat the air inside glass pipes that can then be pumped directly into the reactor, to maintain heat. It is very important the the temperature gradient not change to much, especially if it doesn't climb above 30 degrees or the cells will become damaged. foundation with two boards, that was designed to accommodate all three control valves and switches. The light source , a day light lamp (Osram 965 30w?) was placed in the middle of the spiral, and used not just for light but also as a low heat source. To maximize the light output we attached a cylindrical reflector of high reflective aluminum plating around the hose. In the base and ground plate we cut four holes so that fresh air could enter, so that the warm air would circulate through the array, in accordance with the Kamin effect. These holes would help stabilize the temperature, in order to give the bacteria their optimal temperature. 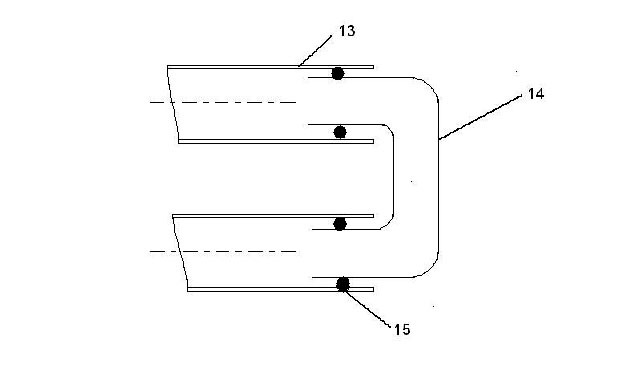 The next important point was the selection of the individual pumps. For that we did a series of pump tests with many pump types (plunger, membrane, hose etc.) and calibrated their pumping power to meet the demands of our reactor. These tests showed that for continual pumping of the growing culture from the reactor the high grade membrane pump was the best. This was because one was able to adjust the force of the pump, and the hub. For the pumping of the sterile air we installed a large aquarium pump. In the air system we had a prefilter, a flowrate meter, a main sterilizing filter, (pore width 0,2µm) the gas storage unit (g1) the substrate, and a sterile filter as guard against an overflow of non sterile of air. Parallel to the construction of the reactor, we distilled three liters of substrate for the first trial run. To control the reactor we installed three way hoses, that were secured to a control board. With these hoses we could control the inflow and outflow mechanically. Furthermore the pumps and lights were controlled through switches that were fastened to the bottom of the reactor. Behind the control board was a growth container for the bacteria. To maintain there sterility of this flask, it was insulted. From this flask the final substrate would be pumped into the reactor. This set up is used in the set up phase. The essential set up is the same in practical use except for the SSK, which would have to be changed for outdoor use. 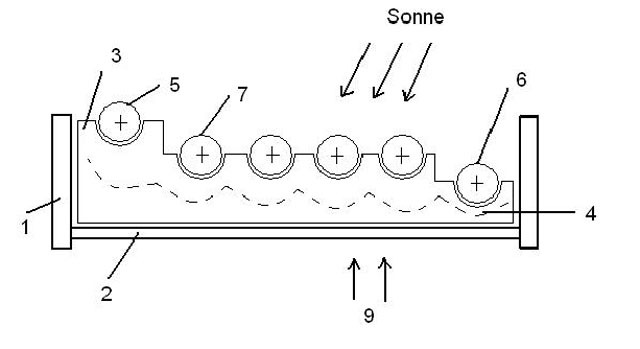 The substrate flows through the sun heated glass pipes, which with a special coupling mechanism can be connected at right angles. 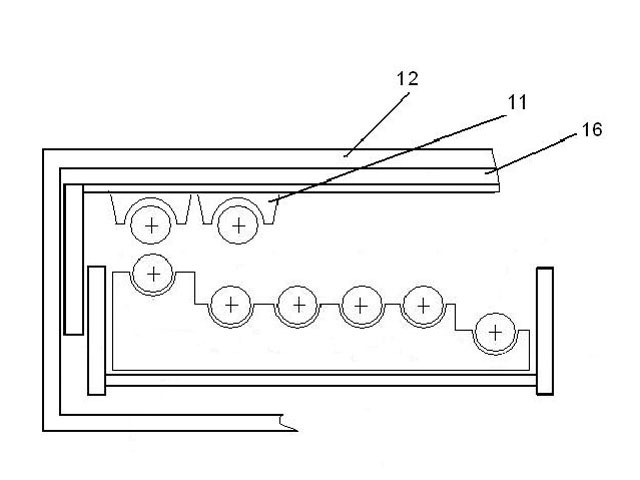 With this device 10-20 glass reactor lines can be connected to each other in order to create a large solar collector, without the having to have a glass covering like a normal solar panel. Aluminum reflectors can also be positioned around the glass tubes to optimize heat collection. Too prevent overheating the solar panels are covered with a window shade like ventilator. Too prevent overheating the solar panels are covered with a window shade like ventilator. In order to use the device in the winter, we envisioned that the SSK would be illuminated with fluorescent lamp, positioned as close the device as needed, with the whole system insulated so in order to make the entire system as efficient as possible. For the breeding of the microorganism a very high degree of sterility was needed in order for the system to function as planned. Since we did not have a sterile cabinet at our school, we built a sterile box from two aquariums, with the guidance of our partner school. The open sides were covered with a thick cloth in places taped cloth, and filled with a 70% ethanol mixture for disinfection. Though the Bacteria where in a sterile substrate we still had to sterilize the whole workplace. After assembling the equipment we pumped a 70% ethanol solution through the entire system. It was then left in a dry closet for three hours at 120°C to allow the alcohol to evaporate in a sterility. After the sterilization, the sample was injected into 3L of sterile solution, in a 5L container (sterile) and pumped through the membrane pump at the desired rate through irradiating and thermal tubes. At the same time sterile air (3L/hour) through the sterile gate into the enhancement container where CO2 and Nitrogen were added until the saturation point was reached. The growth of the bacteria can be achieved through photosynthesis or controlled with the flat flask method. Once the desired concentration of microbes is reached, the excess is pumped into the fertilizer solution, while at the same time new sterile medium is pumped into to replace the exhausted or lost solution. The whole system runs perpetually with occasional outflows of fertilizer solution. The whole system is built out of many common technical materials. With more experimenting we could determine the optimal conditions and system for the best growth, with the least energy. The next part being a possible overhaul of the current SSK design. Filter-Photometer: WTW PMP 3000, Analysis strength (d= 0,1mg). To monitor the growth of culture, we would occasionally remove a sample, using the three way valve, and measure its growth by observing how much light could pass through it, in a 10mm flask λ= 415nm, because exactness was very important for us. Our extinctions value lay between 0.1-1.4. We attempted to design out own variant on this system with a homemade flat flask. The value would be determined by the rate of settlement in a solution with a predetermined consistency (60µL/200µL) . This flask could measure the cultures (pr-edried for 5 hours at 60 degrees.) easily measure the extinctions value with a common photometer. This would eliminate the problem of the inability to maintain standard procedures during the liquid phase, which can effect the results. At the moment the gravimetric and photometric systems do not line up, and we feel that there is still something missing from these systems.